Every once in a while (like when the temperature drops below 20 degrees for days on end), I crave beef stew—something vegetarian is just not going to cut it. Every once in a while (like when the temperature drops below 20 degrees for days on end), I crave beef stew—something vegetarian is just not going to cut it. For health and environmental reasons, I buy only grass-fed beef. 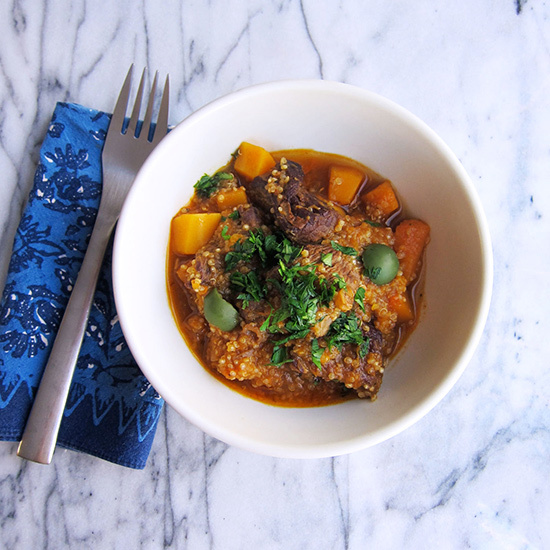 It’s more expensive, so I buy less and add enough other ingredients—in this case butternut squash and quinoa—to the stew to make it satisfying. Since this one-pot dinner has a South American feel, try it with an Argentinean Malbec. 1. In a large, heavy pot, heat the olive oil until shimmering. Season the beef with salt and pepper, add it to the pot in a single layer and cook over moderately high heat, turning the pieces halfway through, until well browned all over, about 6 minutes. Transfer to a plate. 2. Add the onion and garlic to the pot, season with salt and pepper and cook over moderate heat, stirring, until softened, about 8 minutes. Add the tomato paste and oregano and cook until fragrant, 1 minute. Return the beef and accumulated juices to the pot, add the water and bring to a boil. Cover the pot and simmer the beef over moderately low heat for 1 hour and 10 minutes. 3. Add the quinoa to the stew and stir a few times to make sure it’s covered in liquid, then stir in the squash. Cover and simmer until the squash, quinoa and beef are tender, about 20 minutes. Stir in the olives and soy sauce and cook for 1 minute. Season the stew with more soy sauce, salt and pepper if desired. Transfer to bowls, garnish with parsley and serve. Make Ahead The stew can be refrigerated for up to 5 days; reheat gently, adding a little more water if needed. One Serving 375 cal, 16 gm fat, 3.2 gm sat fat, 32.8 gm carb, 4 gm fiber, 29 gm protein. Wine: A rich Malbec, such as a 2011 Catena.